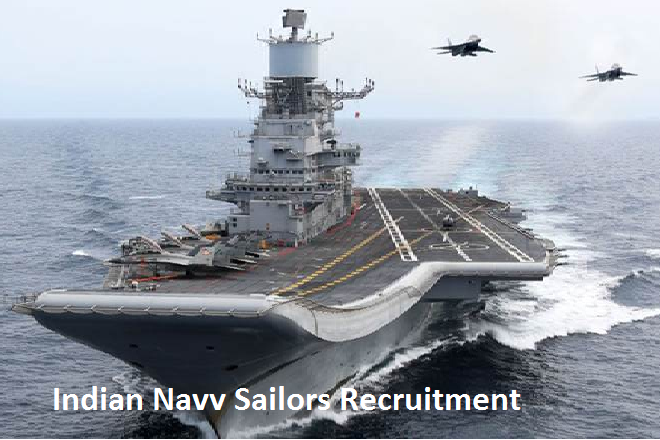 Indian Navy Recruitment 2018-19 – Apply through Online for 500 vacancies of Sailor posts: Indian Navy recently released a job notification on its official website joinindiannavy.gov.in for Sailor posts. Candidates are allowed to apply for Indian Navy Recruitment 2018 from 14.12.2018 to 30.12.2018. Candidate can find further details like Eligibility Criteria, Age limit, the Selection process of Indian Navy Recruitment 2018 on the below page. Job Seekers can apply for the post through the Official page joinindiannavy.gov.in and careers99.com. Latest Update: The Indian Navy Notification is released & the last date to apply is Dec 30th, 2018. And the Application link and Official notification are given at the bottom of the article. Indian Navy Notification 2018 announced for the vacancies of 500 Sailor on its official website joinindiannavy.gov.in. Eligibility criteria, Educational Qualifications, Age limit, Selection process, Pay scale and other required details are mentioned below in careers99.com. So candidates who are interested and eligible can apply Online before the last date of the Notification i.e., 30.12.2018. 1. Pay & Allowances. During the initial training period, a stipend of Rs. 14,600/- per month will be admissible. On successful completion of initial training, they will be placed in Level 3 of the Defence Pay Matrix (₹ 21,700- ₹69,100). In addition, they will be paid MSP @ ₹ 5200/- plus ‘X’ Group Pay @ Rs 6200/- per month plus DA (as applicable). 2. Promotion Promotion prospects exist up to the rank of Master Chief Petty Officer-I, i.e. Level 8 of the Defence Pay Matrix (₹ 47,600- ₹ 1,51,100) plus MSP @ ₹ 5200/- plus ‘X’ Group Pay @ Rs 6200/- per month plus DA (as applicable). Opportunities for promotion to commissioned officer also exist for those who perform well and qualify the prescribed examinations.